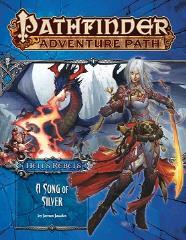 #100 "Hell's Rebels #4 - A Song of Silver"
"A Song of Silver," a Pathfinder adventure for 10th-level characters, by James Jacobs. A study of the former faith of the dead god Aroden, by Erik Mona. A retrospective collection of NPCs for each of the previous Adventure Paths, by various authors. A descent into evil in the Pathfinder's Journal, by Stephanie Lorée. Four exciting new monsters, by Adam Daigle and James Jacobs. A poster map depicting a key battlefield within the adventure.